One of the ASX’s top listed copper developers, Hot Chili (ASX:HCH), could well be the bourse’s most underappreciated – albeit with some of the greatest potential. Its flagship project is the large-scale Productora Copper Project — a joint venture with Chilean mining major, CMP (80% HCH, 20% CMP) that has a resource base of 1.5Mt copper and 1Moz gold. HCH boast an advanced copper portfolio which it is expanding into a coastal copper super-hub that can tap into the infrastructure-rich Vallenar coastal region of central Chile. That expansion came into play today following the announcement that HCH is in the process of securing an option to acquire a 100% interest in a major, privately-owned, copper-gold porphyry discovery — the Cortadera Discovery. Cortadera is a strategic play for HCH, located just 14 kilometres directly southeast of the company’s large-scale Productora copper project at low altitude along Chile’s coastal range. A Cortadera-Productora combined development is likely to emerge as one of the few low-capital intensity, high-margin, large copper developments available globally and HCH say it could place within the production scale range of the top 30 largest operating copper mines globally. Cortadera comes with one of the most significant (underexplored) set of copper-gold porphyry discovery drill results since the discovery of $675 million capped SolGold’s (TSX/LSE: SOLG) Cascabel deposit in Ecuador. 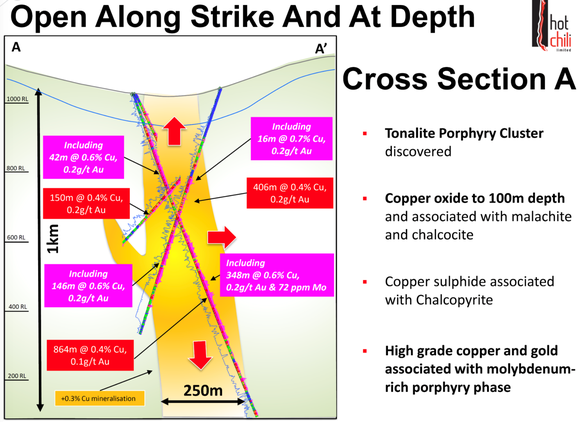 Multiple wide high grade copper-gold intercepts, of greater than 1% copper, have been recorded from shallow depths at Cortadera indicating a blanket of supergene enrichment. And the discovery remains largely open and has demonstrated potential to host a larger resource base than Productora. While the option to acquire Cortadera is major news in itself, it wasn’t all that HCH had instore for the market this morning. The company also announced that it has executed an option agreement to purchase the Purisima mining right, which contains a portion of the Cortadera copper-gold discovery. The agreement to acquire 100% of the mining right, clears a path for the consolidation of the entire Cortadera copper-gold discovery and reinforces Hot Chili as having one of the largest copper developments on the ASX. 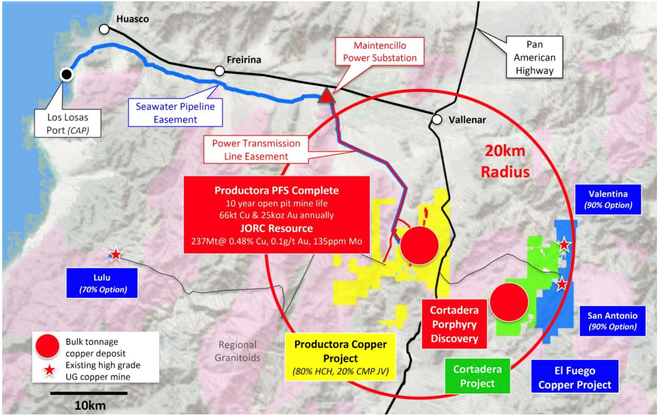 The deal could lay the foundations for the creation of a globally significant new copper development centred around the two bulk tonnage copper-gold deposits: Productora and Cortadera. Interestingly, HCH’s resource base is more than twice that of fellow copper explorer MOD Resources (ASX: MOD). 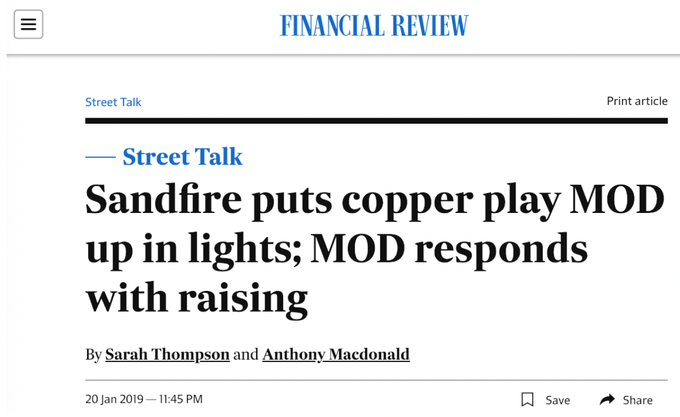 The $55 million capped MOD, and its African assets, recently attracted a takeover offer from the $1.14 billion capped Sandfire Resources (ASX:SFR). Could HCH be a target too? All up, if HCH proceed with these acquisitions, it will have the immediate critical mass required to develop a new large-scale, long-life copper mine, transforming Hot Chili into a premium ASX-listed copper developer. And the immediate point to note is that the market is yet to appreciate its potential, all the while attention seems to be turning to ASX copper juniors. 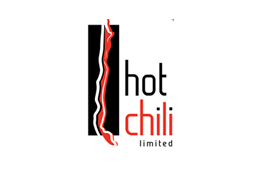 After emerging from its trading halt this morning, Hot Chili (ASX:HCH) greeted the market with some welcome news. Following 18 months of high-level discussions, the company executed a binding memorandum of understanding (MoU) for an option to acquire a 100% interest in Chilean mining group SCM Carola’s large landholding Cortadera, which adjoins the Productora and El Fuego copper projects. The purchase price to acquire the major copper-gold porphyry discovery, Cortadera, is US$30 million, payable in three instalments over a 30 month term. Before digging into the highlights of the project, here’s a map outlining the location of the Productora project in relation to Cortadera, the new growth projects and coastal range infrastructure. Cortadera adjoins HCH’s Productora and El Fuego copper projects, located at low altitude along the Chilean coastal range, 700 kilometres north of Santiago. An estimated US$15 million of drilling and exploration activities have already been undertaken across Cortadera since its discovery. Yet with Carola being a private company, these drill results have never been publicly released, until now. These activities translate to HCH being in a position where it can move quickly and at low-cost towards a dramatic re-shaping of the company’s open pit resource and reserve base. 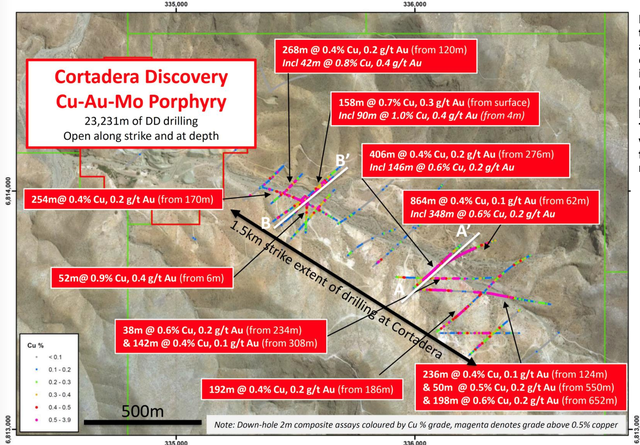 Plan view across the Cortadera discovery area displaying significant copper-gold drilling intersections across two confirmed tonalitic porphyry intrusive centres. While no JORC-compliant resource has been estimated at Cortadera, HCH doesn’t expect there to be much work required to establish an initial and significant JORC-compliant copper-gold-molybdenum mineral resource estimate from surface. 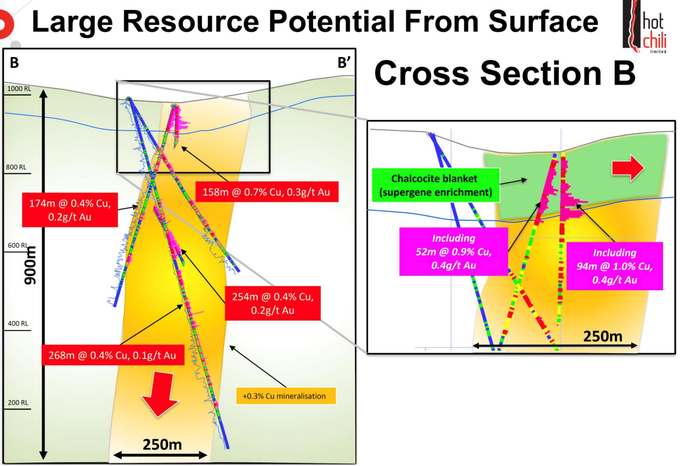 HCH also sees the Cortadera deposit as having potential to host a larger resource base than at Productora, which is currently 1.5Mt copper and 1Moz gold. The addition of Cortadera looks likely to provide HCH with the immediate critical mass required to develop a new large-scale, long-life, coastal copper mining centre which leverages off existing infrastructure advantages that HCH has already secured with its JV partner, Chilean mining major Compania Minera Pacifica (CMP) at Productora. Another advantage of incorporating Cortadera into a single larger development with Productora, is to take advantage of planned central processing facilities. Other news from HCH today was the announcement that it has executed an option agreement to purchase the Purisima mining right, which contains a portion of the Cortadera copper-gold discovery. 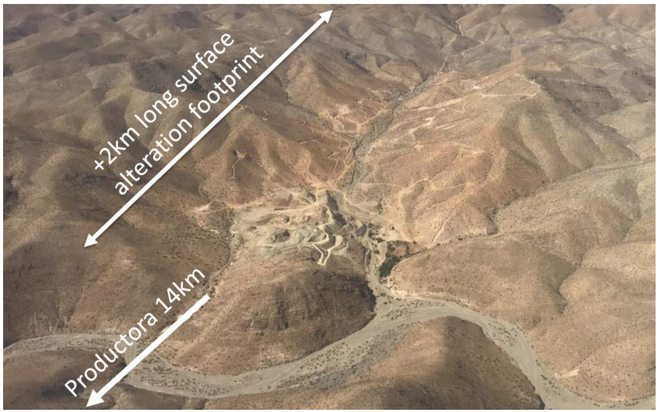 The agreement to acquire 100% of the mining right, clears a path for HCH to consolidate the entire Cortadera copper-gold discovery and reinforces the company as having one of the largest copper developments on the ASX. Some 4000 metres of the entire 23,231m of diamond drilling (HQ core) completed at Cortadera are contained within the Purisima mining right, accounting for one of the three porphyry centres discovered to date. 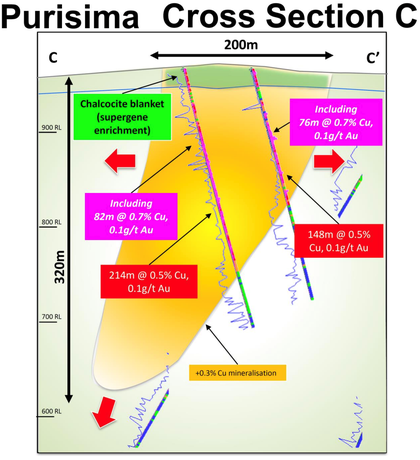 Significant drilling intersections at Purisima, similar to those announced already, reveal wide copper and gold mineralisation from surface which remains open at depth and along strike. The mining right Purisima contains approximately 500m strike extent of the entire two kilometre long Cortadera discovery zone. Section C displaying drilling results and an interpretation of one of the host tonalitic porphyry intrusions at Cortadera, within the Purisima Mining Right. As mentioned, the Cortadera discovery comes with one of the most significant set of copper-gold porphyry discovery drill results since the discovery of SolGold’s (TSX/LSE: SOLG) Cascabel deposit in Ecuador. Cascabel is one of the few new copper discoveries expected to come online in the near future and has the support of Australia’s largest gold producer, the $19 billion capped Newcrest Mining (ASX: NCM), which recently upped its stake in SolGold to secure a portion of the Cascabel. Hot Chili’s expanded landholdings are pivotal for the company, and follow a similar move by neighbours $13.5 billion capped Teck Resources (TSE:TECK) and $21.3 billion capped Barrick Gold Corp. (BCBA:ABX) at their Nueva Unión copper project in Chile, where the Relincho and El Morro deposits were combined to form a more robust consolidated copper development. Other news of interest to HCH shareholders is Sandfire Resources (ASX:SFR) approach to MOD Resources (ASX|LSE: MOD) about a potential takeover and expressing an interest in exploring the potential to combine the two companies. The $1.1 billion-capped Sandfire, which owns the DeGrussa gold-copper project near Meekatharra, has its eye on MOD’s 100% owned 60Mt @0.98% T3 Copper Project in the central Kalahari Copper Belt, Botswana as it seeks to expand its copper exposure. SFR has made an offer worth 38¢ per MOD share, valuing the explorer at about $94.5 million — a hefty premium to MOD’s $55 million market cap at the time. MOD was trading at 22c at the time of the offer, yet the company’s board believe Sandfire’s 38 cent per share offer “undervalues MOD’s unique and extensive assets”. What’s really noteworthy here is a comparison between HCH and MOD. HCH and its Chilean copper projects have a number of advantages over MOD’s Botswana assets. The first is the obvious location difference, with Chile being the more established mining destination, with superior regional infrastructure and without the well-known risks of African mining endeavours. And with the never before seen high grade intersections at Cortadera, HCH’s copper grades compare exceptionally well to that of MOD. What really stands out here is that HCH is trading at the basement bargain price of just 1.1 cents per share, for a market cap of just $8.54 million — well below both MOD’s market cap of $55 million prior to SFR’s offer, and significantly less that the $94.5 million offer. It’s certainly not hard to speculate that HCH could very soon attract some of the attention that’s been directed at MOD, from larger players, and smaller shareholders alike. With two acquisitions in the pipeline that could be company makers, HCH is in prime position to capitalise on the thirst for strong copper assets.